Those of you who have been in model building for a long time, recall that many years back, a company named Chartpak offered a range of very thin tapes that were mostly designed for people doing architectural work, but that came in very handy for model building as well. They are now, as far as I know, no longer in business an so there has been a considerable void when it comes to very thin tape. JammyDog from the UK has now come to our rescue with a full line of tapes that range from 10mm to .5mm. Jammydog also has a low tack blue masking tape offered in 3,2 and 1 mm thicknesses (the 1mm tape is shown). Finally, a Polypropylene masking tape which is to be used where a very thin film tape is needed. This tape is also offered in a variety of sizes from 3 to .5 mm in width. The samples shown are 1.5mm and .5 mm. In all, an excellent tape that gives good performance for when you need something really thin. I have tested each one on an older model and it works as nicely as you'd want. Examples would be doing the sealant around modern jet canopies or cheat-lines on airliners. Their standard paper tape can be used for general masking as well in the wider sizes. Update: I've had a chance to use these tapes on a driver figure. I used all three types of tape in several different widths. On the driver's helmet I used the white, paper tape, on the arms, the .05mm plastic tape and on the suit the 1mm blue low tack stuff. This was also used for the stripe on the pants leg, though it is difficult to see. In all cases, the tape held firmly and did not allow the paint to seep under it. These were painted with a spray can so you know there was a lot more paint flowing than normally. 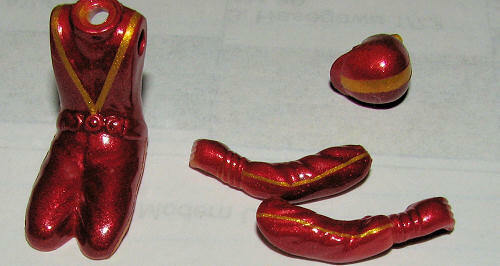 I also found that the tape was able to hold curves where it was needed, as you can see on the arms. I'm very pleased with how well it worked and can very much recommend this tape to those who have a need for thin masking material.